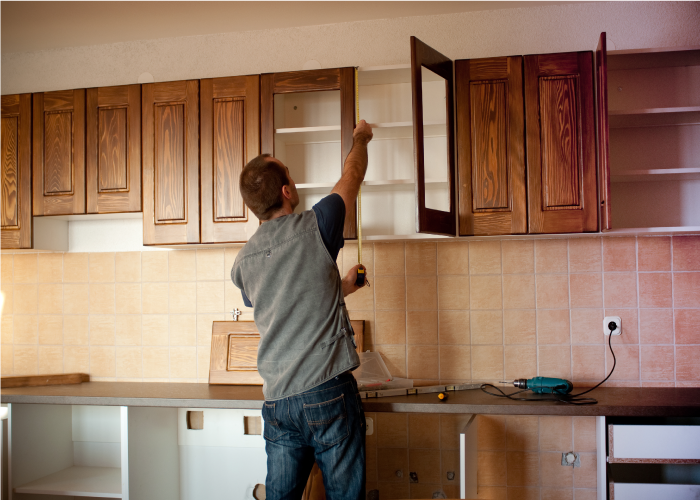 Depending upon the number and existing finish on the cabinets, refacing the cabinets can be a viable option. Refacing works best with smaller kitchens and limited number of cabinets. If the kitchen is large, repainting the cabinets with high gloss paint can make kitchen cleanup easier for the new owner. Some contractors use glass cabinet doors to give a kitchen a more open look. Another budget friendly idea is to remove the doors completely, patch all of the holes from hinges, repaint with high gloss paint, and stage with glistening new dishes and glasses. Additional matching open shelving can add storage and a decorative touch. A budget kitchen remodel idea that lends bang to the buck is new lighting fixtures. Updating the lighting can be between $100-$200 for a savvy shopper. For some, the use of ceiling fans is outdated; however kitchen ceiling fans have purpose and add supplementary lighting economically. Vinyl flooring has come a long way in the last 20 years. From classic prints, solids, and wood finish vinyl can look expensive without breaking the budget. If single sheet vinyl is not a viable option, vinyl tiles can be cut to fit even the most oddly shaped kitchen floor. Adding a pot rack staged with some stainless steel pots and pans adds glamour to a dull ceiling area. Some racks have additional hooks around the edges for utensils as well. Using the look of stainless steel or glass, range backsplash panels can add flair and a central point to draw the eye of the prospective buyer. Single panels can be used as an inexpensive kitchen remodel feature. Use sheer or semi sheer fabrics for tie ups or curtains to allow natural light to enter the kitchen areas without adding unsightly glare. Learn some additional budget-friendly ideas with this handy guide. Countertop materials can range from to inexpensive to exorbitant. Using the best countertops that won’t break your bankis essential. For a budget kitchen remodel to have elegance, Formica has several alternatives to marble, soapstone, quartz or other high end coverings. Formica can be purchased and mounted with matching backsplash on the section. Holes can be easily cut for sink and other custom insets. If the counters only need to be recovered, Formica also has customizable sheets which can be cut and glued to existing counters for an expensive looking upgrade. Inexpensive kitchen remodels do not have to be pricey or look cheap. Updating the kitchen faucet and sprayer can give a new crisp appearance without swallowing the whole budget. Even small items like replacing cabinet handles and drawer pulls can give an average kitchen a fresh new look. Adding a few small potted herbs will freshen the air and give the kitchen a ‘ready to go’ sense for the prospective buyer. For investors looking to save money on their fix and flip projects, LendingOne does not charge interest on unused rehab funds while also offering up to 100% financing on your rehab costs. These are just two of the many ways LendingOne can help fix and flip investors stay on budget. Apply today and get your instant rate quote.